These No Bake Mint Chocolate Bars are one of my ALL-TIME favorites! 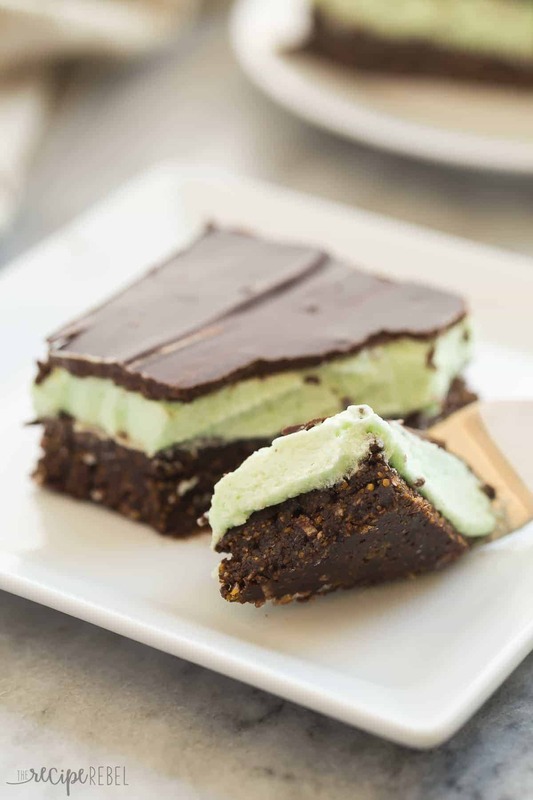 Made up of a no bake graham cracker crust and topped with a creamy mint frosting and chocolate ganache! This recipe appeared first on RecipeGirl. I want to see hands from all my mint chocolate lovers! Where are you? The husband and I love the mint chocolate combo. We disagree on our share of things, but generally dessert is not one of those things. Unless it’s pumpkin — then he’s all in and I’m on the edge somewhere. But mint and chocolate? There’s never been any question. 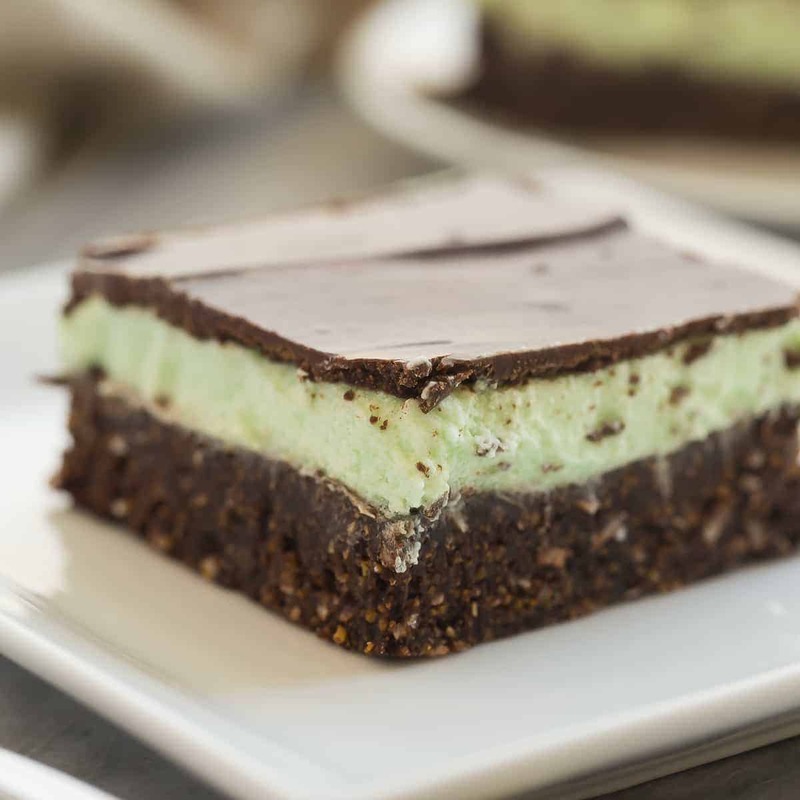 When I told him that these No Bake Mint Chocolate Bars were coming up on the blog (which would mean a batch or two to photograph and, obviously, taste test) he was pretty excited. 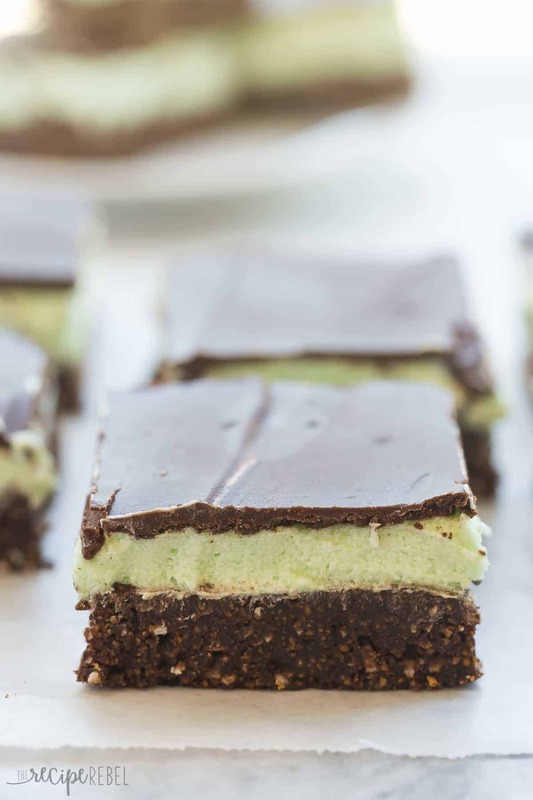 I would have to say that these bars are one of our all-time favorite bars. The recipe is one I’ve had in my folder of recipes (yes — it is originally written on paper!) for years and years. And years. But I haven’t made it very often lately because, well — there are so many new things to try! I would probably even say that these bars don’t happen once a year for us. They should, believe me, and you can bet that they will now! But I think we kind of forgot about them. I don’t think that’s going to happen again anytime soon! I tried making the base without the egg, because I feel like there are people out there who will be all like, “a raw egg?!? Grrrrrossssss!” But it’s not raw, the egg cooks in the hot cocoa mixture and it binds everything so well that it can’t be left out. 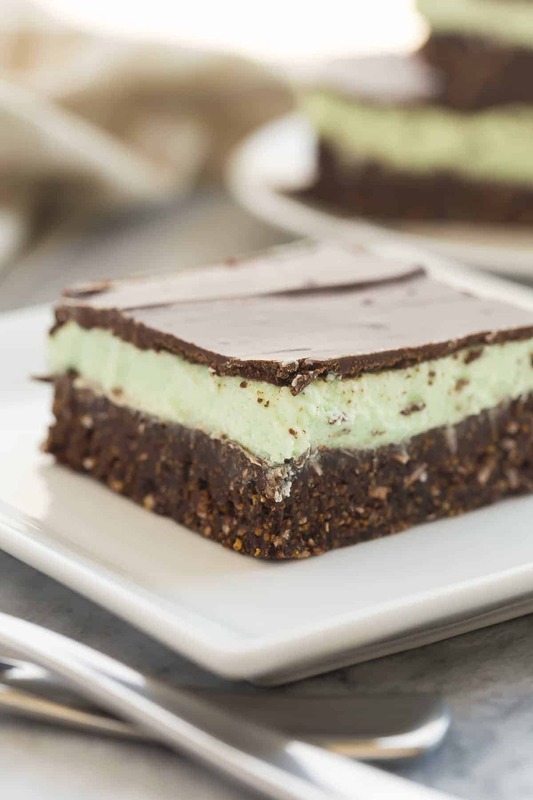 The filling is a perfectly cool and creamy mint buttercream frosting, and the chocolate ganache, well, it’s more chocolate and I think that’s saying enough. BaseLine an 8x8" pan with tin foil. In a large microwave-safe bowl, combine butter, sugar and cocoa and microwave on high for 45 seconds. Stir, and microwave on high another 20-30 seconds if necessary so that all is melted and combined. Let cool 5 minutes and quickly whisk in egg (mixture will thicken as the egg is incoprorated). Stir in graham crumbs and coconut until combined. Press into prepared pan. Filling:With an electric mixer, beat butter until smooth. Add powdered sugar and 2 tablespoons milk and beat until smooth, adding a little more milk or sugar to reach desired consistency. Add mint extract and green food coloring (as desired). Spread over base in pan. Ganache:In a medium microwave safe bowl, combine chocolate and butter and melt in 20 second intervals on high, stirring each time, until smooth. Pour over filling in pan. Refrigerate until completely set, at least 2-3 hours, before slicing and serving. Store in the refrigerator or freeze for up to a few months. Line an 8×8″ pan with tin foil. With an electric mixer, beat butter until smooth. Add powdered sugar and 2 tablespoons milk and beat until smooth, adding a little more milk or sugar to reach desired consistency. In a medium microwave safe bowl, combine chocolate and butter and melt in 20 second intervals on high, stirring each time, until smooth. Pour over filling in pan. What kind of chocolate do you use for topping? I would like to find a way to have the chocolate topping not crack when you cut it after its set. You can really use any chocolate but I always use semisweet. If you want the chocolate topping not to crack, you may want to add a tiny bit more butter or a tiny bit of cream. It will make the top softer but you don’t want it too soft. I also recommend popping them into the freezer for a couple hours before slicing for nice clean slices. The recipe looks delicious! Could you tell me if you use sweetened or unsweetened shredded coconut? Thank you! I would probably use unsweetened because they are pretty sweet to begin with! Hi Ashley! I have a real weakness for coconut, so I love that you put in the base! If i make all the wonderful holiday treats I’ve seen lately I will be “rolling” instead of ringing in the New Year! Haha! I think I will too! It is hard to resist all the sweets and treats this time of year!